The touch pad allows you to set a comfort level using the patient’s weight. Once set,the computer technology inside constantly monitors the pressure. Solenoid valves open and close to regulate the air inside the mattress to maintain the pressure to avoid capillary occlusion. The compressor will turn off while in maintenance mode for a quiet, energy saving, improved sleep environment. In the event of a power outage, the mattress will remain inflated as long as the mattress air hose remains connected to the compressor.Once the power is returned, the memory inside the power unit returns to the programmed settings. 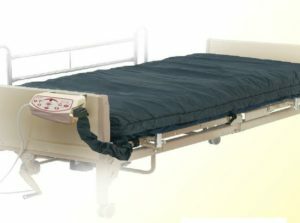 The safety mat inside the mattress prevents the patient from bottoming out. When activated at the push of the button, air is sent inside the mattress to keep the mattress environment cooler for the patient, as well as help with moisture management.